Bubba heard of a country that is just his size and had to go for a visit. San Marino is completely surrounded by Italy. It has no ports or harbors, no airport, and only one road in. Most of the country is located on a mountain top. It has a population of about 30,000 people in about 24 square miles. It is protected by The Guard of the Rock, The Guard of the Council Great and General, and The Crossbow Corps. No lie. It has not yet joined the European Union and remained neutral in WWII. Abraham Lincoln was an honorary citizen. Bubba is excited about visiting such a unique place. From Florence I went to Ravenna and from there I took a train to Rimini. 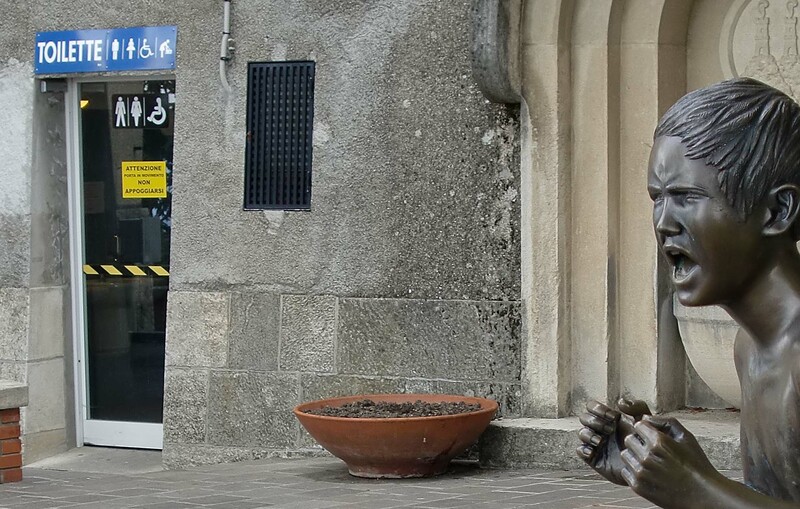 I was about to cross the Italian/San Marino border and made sure I was ready for the immigration station located across from the train station. After going through a rigorous security screening that made the TSA look like a joke, I submitted to a background check and criminal records check. The daily number of people allowed to go into the country is strictly limited. Let me explain what Bubba really meant to say. Across from the train station in Rimini is a bus stop. 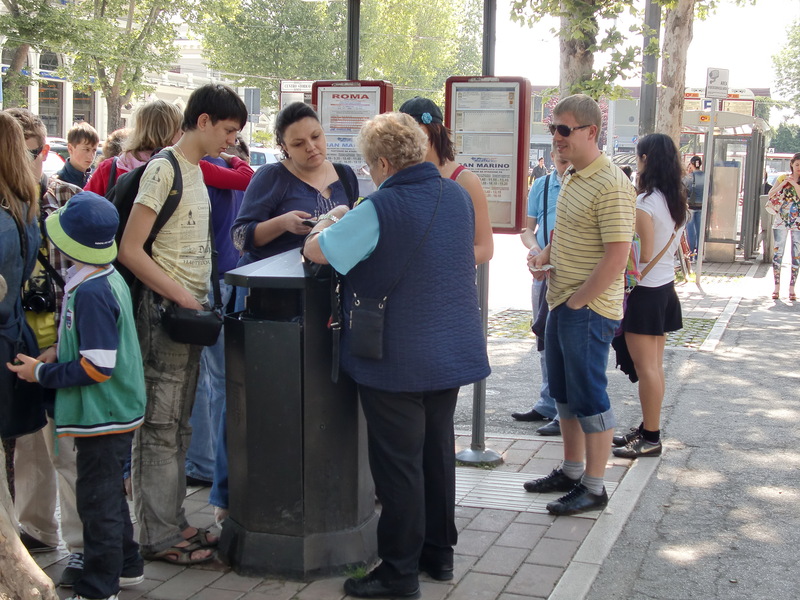 A ticket seller comes by and sets up shop on a trash bin to sell bus tickets to San Marino. The only thing that is checked is the amount of money you have for the ticket. The number of people is limited…to the number of people they can cram, sitting and standing, on the bus. I took the bus, which was an adventure ride in itself. One of the last people to board was a nice looking young lady who was given a place to stand next to the bus driver (you know, that place that says, “Don’t Stand Here”). The road to the top is windy and narrow and, today, it was wet from rain, but that didn’t stop the driver from furthering his romantic life while driving. The drive to the top was like driving on San Francisco’s Lombard Street in a grand prix race combined with a speed dating service. He would watch her on the straights and the road on the curves. Both the bus and the driver were fast and, by the time we reached the top, he had made plans to meet up with her later. Actually that was fairly close to the truth. At the top I needed to use the rest room. I saw a rather distressed person standing by the rest rooms. I noted the closed sign and tape across the door. He looked like he needed it worse than I did and I joined him in his complaint. I finally snuck into the palace and used the facilities. 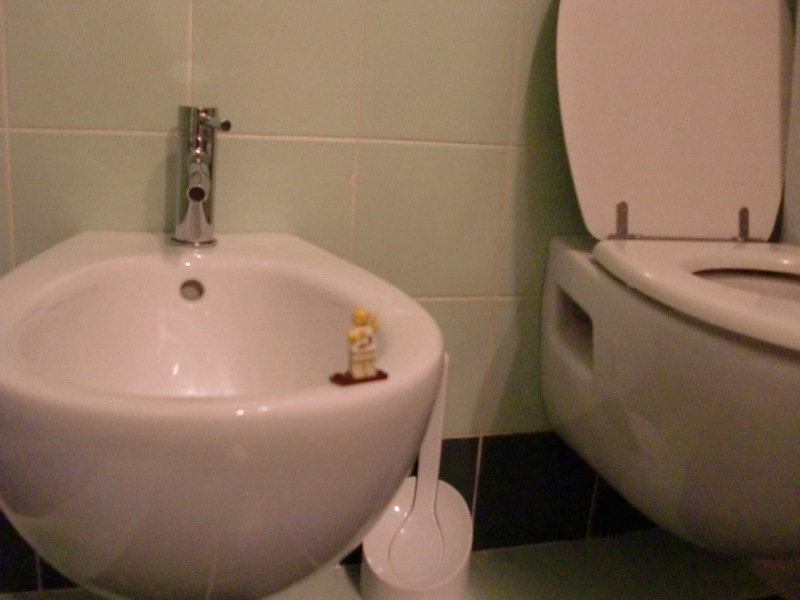 I love these Europeans; they have a second toilet that is a bit smaller, just for me…and no lid to put down. After freshening up, I breezed through the town but missed a lot because of the rain storm that blew in. Mountain tops tend to pick up any passing clouds. I did manage to catch the return bus in time to catch the return train to Ravenna. In Ravenna, I sampled some of the local Italian food. 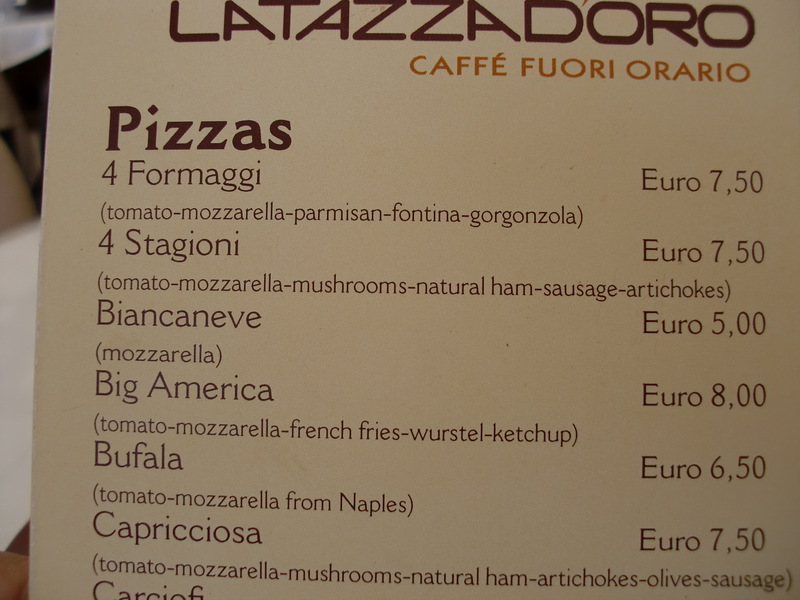 I had a pizza, The “Big America” Pizza. Wurstel is a sausage type thing. Yes, that makes the “Big America” pizza a sliced up cheese dog with fries on a pizza crust. From Ravenna, Rimini, and San Marino, Bubba then went to Venice which he will speak about next time. 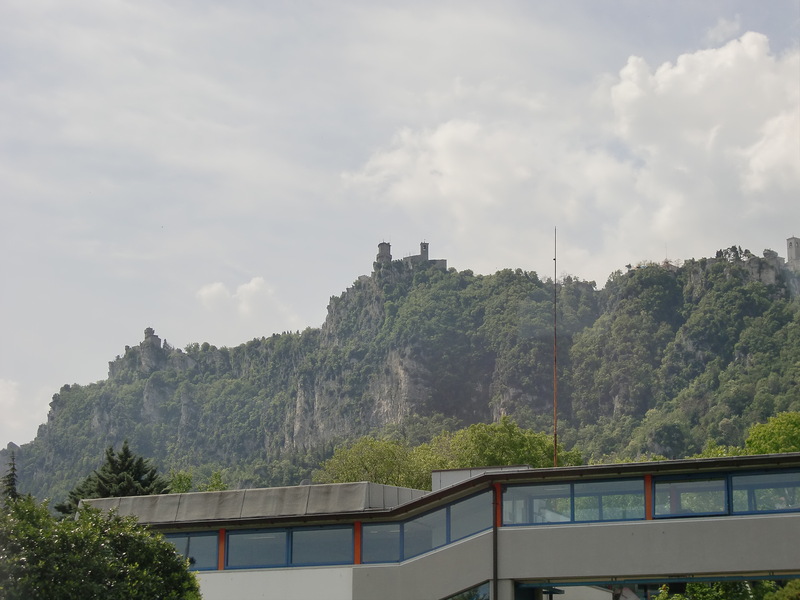 This entry was posted in Holiday, Humor, italy, Legos, Travel and tagged San Marino. Bookmark the permalink. Awesome article. I should claim A New (Bubba Sized) Country is the very best post in the subject.